TORONTO—Celebrity chef Christine Cushing has been showing Canada how to cook for almost 15 years. As the former host of Food Network’s flagship series Christine Cushing Live, current host of Oprah Winfrey Network’s Fearless in the Kitchen, resident chef on the Marilyn Denis Show on CTV, and author of three best-selling cookbooks, Ms. Cushing’s life revolves entirely around food. 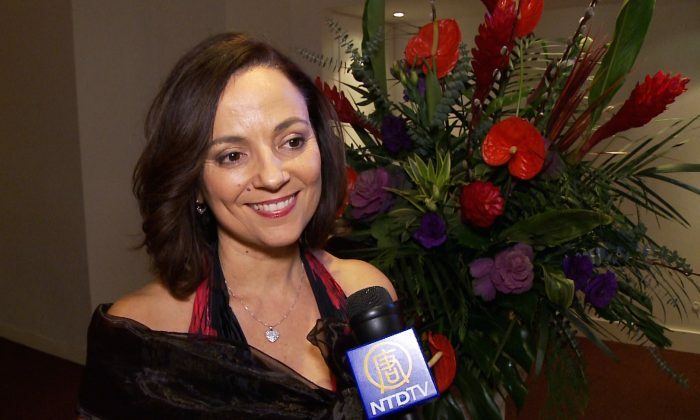 She experienced the unique flavour of classical Chinese dance and music for the first time on Jan. 22 at Shen Yun Performing Arts, and was blown away. “It’s breathtaking, really, it’s a magical performance,” she said. New York-based Shen Yun is the world’s premier classical Chinese dance and music company, formed with a mission to revive 5,000 years of divinely inspired culture. Ms. Cushing said the company’s effort to showcase traditional culture Chinese through story-based dance—recreating ancient myths and legends—was highly effective. “What I’ve learned tonight is that there is a lot of artistry and storytelling in the Chinese culture,” she said. Ms. Cushing was also delighted with Shen Yun’s many ethnic or folk dances, selected from the 55 ethnic minorities in China. The performance featured dances of Mongolians, Tibetans, the Hmong people of southern China, the Li ethnic group of Hainan Island and the Yi of Yunnan province. The high-tech digitally animated backdrops helped to emphasize this point visually, said Ms. Cushing, as it projected stunning scenes and landscapes from China’s multifaceted regions and geography. “You see the snow-capped mountains, the sea, the tropical—that was spectacular,” she said, adding the costuming was incredible. Traditional Chinese culture and art forms—informed over millennia by the three pillars of Buddhism, Daoism and Confucianism—were largely destroyed during the Cultural Revolution and decades of suppression by the communist regime, says the Shen Yun website. The values of this rich culture—such as compassion, sincerity, honesty and harmony—rang true and have a universal, enduring power said Ms. Cushing. “It also shows us that we’re all really alike [around] the world,” she said. The mission to re-awaken the spiritual culture, and preserve cherished art forms wove through every aspect of the performance, said Ms. Cushing. “I feel that it’s a great effort—I could really sense the spirituality behind it,” she said, adding she felt this represented the authentic Chinese culture.